The Range Rover Evoque Autobiography Dynamics is Land Rover's 285PS answer to the impressive new Porsche Macan and showed off its searing paint job at Geneva to great effect. 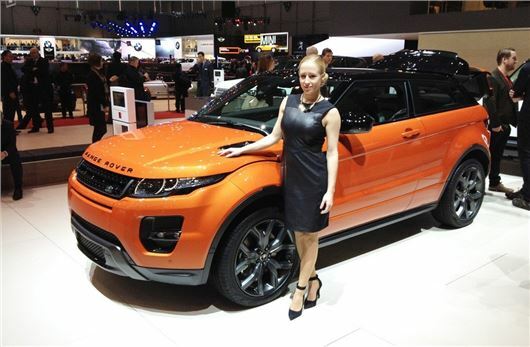 It's the most sporting Evoque yet, and is a useful extension to this already highly-popular range. Power comes from a 2.0-litre petrol engine producing 285PS and 400Nm of torque, linked to the new nine-speed ZF automatic transmission. Land Rover promises the combination of gearbox and engine is more responsive than in current Evoque models. To further sharpen up the car, Active Driveline all-wheel drive is installed as standard, improving traction by sending torque to the wheel where it is needed most. The steering has been retuned to give greater precision, while the suspension has been firmed up – though Land Rover claims this has no affect on ride quality. There are also upgraded brakes with a torque vectoring system to improve cornering dynamics. Styling has been beefed up to match the enhanced performance with a new grille design, deeper front valance, 20-inch alloy wheels and Autobiography badging. The pictured colour – Phoenix orange – debuts on the new model. In the cabin there is leather upholstery available in a choice of six colours, plus illuminated tread plates and a choice of seats. Buyers can select either sports seats or premium climate seats, with both styles sporting Autobiography embossed headrests. There’s also a touchscreen system with support for mobile phone apps. Expect a list price of around £50,000 when it goes on sale later this year.